Venture inland and into the mountains for a visit to a remarkable waterfall hidden in the jungle. The cascades of La Reforma make for a spectacular setting where you can relax.When you reach the community of Reforma, set out for a short walk to reach the grand waterfall itself, which towers nearly 150 feet (45 m) high and runs through an outcrop of stark, bare rocks. The pond below the falls is created by the tumbling water, fed by rains and mountain streams that keep it cool year-round, or go looking for wells and shallow areas across the river. Follow up with a visit to a small restaurant before you start the journey back to Puerto Escondido. From San Pedro Mixtepectou have to travel on Camino a la Reforma road and After a bumpy 1.5 hour drive on this single lane road, you will arrive at the 'Projecta Ecotourism La Cascada Reforma'. 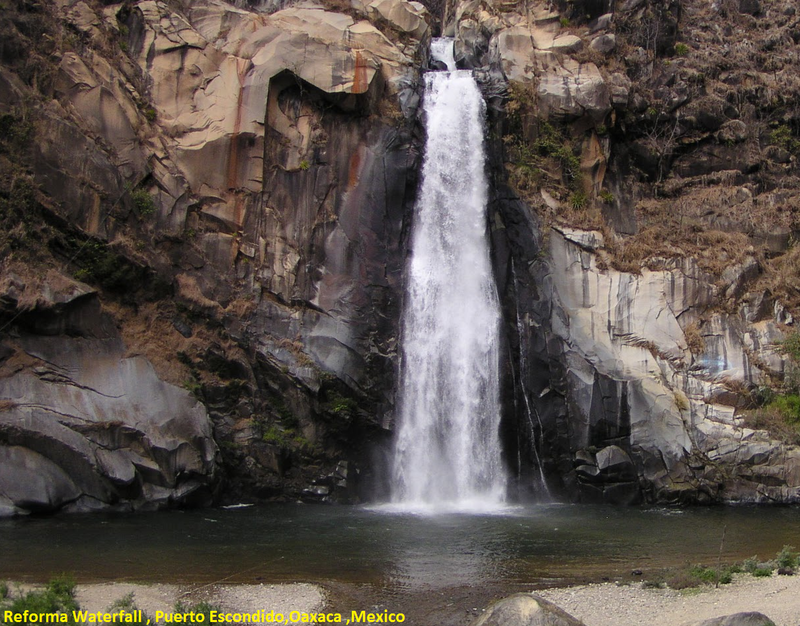 The small community of Reforms supports this waterfall by clearing hiking trails, managing a few solar-paneled cabins (for rent) and handling the few tourists who wander this far off the grid to see backcountry Mexico. You have to hike inland and into the mountains about 30 minutes and will rewarded by a spectacular setting: a remarkable hidden waterfall set in the jungle. Such a refreshing site too. You can have refreshing swim at the cascades of La Reforma.